One of the most frequently asked questions about pop up campers is what type of hitch is needed to tow one. The answer to that question is a little more complicated than a simple matter of looking at hitch class, but it is an important piece of the puzzle, and it’s also one of the main variables you can control if you already own a tow vehicle. If you don’t already own a tow vehicle, then you can limit your search based on factors like GVWR and CCWR, but those numbers are set in stone, but those aren’t things you can really change after the fact. Class I is the lightest duty hitch class that’s defined in SAE J684. According to that specification, class I hitches are capable of handling between 100 – 200 lbs. of tongue weight and 1,000 – 2,000 lbs. of towing weight. That’s quite a range, but it does give you a general jumping off point if you already own a tow vehicle and you’re just starting to shop for a new pop up camper. Looking at those numbers, you’ll have to limit yourself to pop up campers that weigh less than 2,000 lbs and exert less than 200 lbs. on the hitch via the tongue. Of course, you’ll also want to verify how much weight, within the SAE J684 specified range, that your vehicle can actually handle. What Can You Tow with a Class I Hitch? Although Class I hitches are the bottom of the barrel as far as SAE J684 hitches are concerned, you actually have a lot of viable options as far as what you can tow. Of course, you have to look at two numbers to see what you can tow: the tongue weight and the actual loaded weight of a camper. That loaded weight includes the dry weight of the camper itself and everything you put in it before you hit the road, including fresh water and all your camping gear. So while you can technically tow a pop up camper that has a dry weight of 2,000 lbs., in practice you’ll find that loading any gear in it will put you over the safe towing range of your hitch. Scout (Aliner) 15' 120 lbs. 1,174 lbs. 2,100 lbs. Jay Series Sport 8 (Jayco) 11'7" 185 lbs. 1,190 lbs. 1,995 lbs. Palomino 280LTD 11'10" 122 lbs. 1,400 lbs. 2,245 lbs. Clipper LS (Coachmen) 12'2" 120 lbs. 1,305 lbs. 2,098 lbs. Lifetime Sahara 10'5" 180 lbs. 800 lbs. 1,950 lbs. Although not all pop up camper manufacturers offer trailers that can be towed by a class I hitch, a lot of them do. Our above-referenced comparison table is only a sampling of the lightest pop ups available from six popular manufacturers, so it definitely isn’t representative of all your potential choices. Of course, it should give you a good idea about what your options are going to be. If your tow vehicle, and your hitch, can handle the upper end of the class I spec (i.e. 200 lbs. hitch weight and 2,000 lbs. towing weight), then you have a lot of viable options to check out. The Aliner Scout is one of the few a-frame campers that weigh in under 2,000 lbs. Although a-frames tend to weigh in heavier than other pop up campers, you may be able to tow one with your class I hitch. The Aliner Scout, for instances, has a dry hitch weight of 120 lbs. and a dry weight of 1,174 lbs. That does check in below the upper limits of the class I specification, but you have to keep in mind that you’ll be towing a lot more than 1,174 lbs. when all is said and done. In fact, the GVWR of the Scout is 2,100 lbs, so loading it to capacity will overload your hitch. There are a lot more options when it comes to towing a tent trailer with a class I hitch, but you’ll still have the same concerns regarding overloading. The Jay Series Sport 8 does have a GVWR below 2,000 lbs., but other lightweight pop up campers (like the Palomino 280 LTD and Clipper LS by Coachmen) have GVWRs that edge up over that limit. 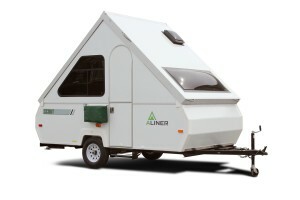 If you’re concerned about weight, then manufacturers like Livin Lite and Lifetime Products make some of the lightest pop up campers on the market today. Livin Lite’s Quicksilver 8.0 has a hitch weight of 150 lbs, but it has a remarkably low dry weight of just 850 lbs. And, of course, a tent-on-trailer pop up camper like a Lifetime Tent Trailer Kit is just about as lightweight as you can get. If you have to stay under 1,000 lbs., which a lot of lighter duty tow vehicles do, then your options are much more limited. You might want to look at Livin Lite’s Quicksilver 6.0, and you can even check out motorcycle campers if it comes to that. While you can tow something like a Lifetime tent trailer with a hitch that’s rated to tow 1,000 lbs., you can’t tow one with a hitch that’s rated at a hitch weight of 100 lbs. 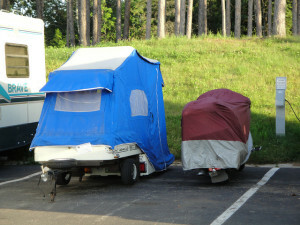 Motorcycle campers are an option when an especially light pop up is needed.